My husband and I hadn't planned on having wedding rings, because I never feel comfortable wearing a ring. Then he surprised me on our wedding day by producing matching engraved silver bracelets. The inscription is in Tolkein Elvish and translates as, "The longest journey begins with a single step." Needless to say, I was delighted - and the bracelet turns out to be really comfortable! When I was married the first time, my original wedding band was actually an anniversary band. My ex ended up pawning it so we could go to his friend's wedding. (Any wonder why he's an EX??) Later, I found a beautiful wedding set in a Lane Bryant catalog. I ended up buying it, and wore it all the time. It cost like $30, and was totally fake, but everyone that saw it thought it was a real diamond. Right now, I am hoping to marry my best friend at some point. He introduced me to the Wheel of Time series, so I am really wanting one of the gold Aes Sedai serpent rings to use as my wedding ring. The down side? It costs $700! Ha! I just bought my husband a replacement wedding band for $25. It's tungsten and was orignally over $200. Our original ones cost us maybe $300, and my engagement ring cost maybe $30? I figure we're married with or without rings, so why spend so much on them? 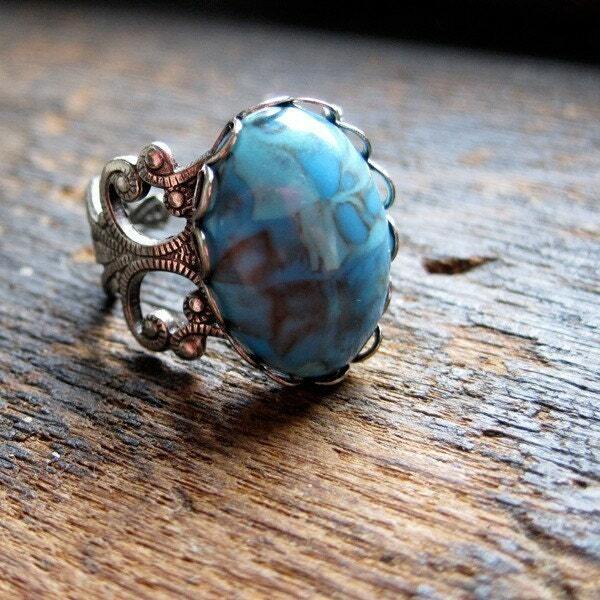 I have to admit, though, I would lovelovelovelove love a set of makume gane rings! But, yeah, that's $5000 I don't have. Well, my husband and I have matching rings from a Museum Company store that were $45 each. Not quite as cheap, but we are still wearing them 9 years later. They are replicas of a ring that is supposedly int he British Museum. I prefer my ring to most of the really expensive ones you see at jewelry stores. Speaking of Captain EO, though, you *do* know the show's back at Disneyland, don't you? I saw it last week. It's so very '80s, yet so awesome. Just the way I remember it. I'm not a big diamond fan, so I wear a gold claddagh as my wedding ring. I totally would wear non-traditional, but my now-hubby went out and bought me the most beautiful traditionl engagement ring and the plain bands we have fit with us perfectly. Careful, though -- hematite is very brittle. I have had several hematite rings crack in half. My goodness, I don't even know you, but when I saw this this I thought of you. Silly right? I don't know if you've seen this before, but I couldn't help myself from sharing this. I love them! I'd totally wear them as wedding bands. But I still want the traditional engagement ring. :) Sadly, I need a boy for that, and there isn't one right now. :( Enjoying the single life and dreaming! alas, I haven't had the opportunity to wear a wedding ring yet, but if and when that day ever comes, I want a non-traditional one--either a black diamond (because they come from space!) or a sapphire. I'd love an Aei Sedai ring or something based on Lord of the Rings too. At the very least, I'd prefer a lab created gem because: a) science! and b) I'd know I wasn't supporting inhumane working conditions for miners. I used to know a couple with tattooed wedding rings--she was allergic to metal, and his work made wearing jewelry unsafe. I know tattooed rings aren't uncommon anymore, but when I first met them ~15 years ago, it was pretty out there. Those magnetite rings are super cool. I'd totally wear them. my Love and I have matching silver rings with an celtic-themed design in them, got them for $20 each at a Renaissance Faire. I have a strong history of losing things, especially rings which you have to take off when washing things or playing sports or any number of other activities. So... my engagement ring which was in my husband's family for generations is back in its box under the care of my in-laws. My wedding ring (titanium, not too expensive) turned out to be a little too thick to be very comfortable so that's in a jewelry box somewhere, I have to assume, in our apartment. What I do wear when we go out is an $18 ring made out of god knows what kind of material that I got from some stall in Hawaii. It's light, it's pretty, it doesn't turn my finger green, and it hasn't rusted so far... and I can't remember where it is right now, so it may have served its purpose of being lost without stress or regret. I'll look around when I get home but worst case scenario, I get to go hunting for cheap, pretty rings again. I've told my boyfriend repeatedly that I'll hurt him if he spends a lot of money on an engagement ring. I'd rather have him save it to put toward bills or a down payment on a house! I've seen a few silver rings that have a simple knot instead of a diamond and I LOVE them. I had a regular gold band, husband had a fancier gold band but after having a baby my ring didn't fit. For year 30 we got bands made of gold, meteorite,a piece of Mars and a piece of the Moon. My sister bought a ring for a dollar at a gas station for her husband while on a family vacation. She bought it as a joke, but when she took it home and gave it to him he exclaimed that it would be his wedding ring, and wore it the rest of the week. On a side note, be careful with those things. If dropped onto a tile floor they can often shatter into many pieces. My husband and I used to do medieval recreation (ok I give, the SCA) and our rings are sterling silver with "You are my earthly joy" on them in old French. Not bad for 40 bucks total! When my husband decided he was going to propose he just couldn't contain himself and proposed without a ring. So we went down to the grocery store and got a 25 cent ring. I wore that till I got my real one and still wear it when mine is getting cleaned or whatever. People think I am crazy but in a way it is my real engagement ring! We got matching wedding bands with Celtic knots. The unusual thing about mine, more than his, is that they're both made from tungsten carbide, which makes the girly girls sneer, since my ring's not platinum and diamond-encrusted. I am sadly allergic to metal (except titanium which we did not discover until a year after our wedding) so my husband and I decided to get matching wooden wedding rings. We ended up with rings made from coconut shells. They looks great and were the perfect fit for my allergies. The only draw back to rings made of anything but metal is they tend to chip and break easily. Getting married (er, civil unioned? ), my partner and I had spent way too much on everything else so we spent ten bucks each on jet black stainless steel temporary rings. It took another year to get the permanent bands, but we've held onto our original "cheapies". My engagement ring was a 28 carat blue topaz. It's an ice skating rink. It seriously takes up the entire space between the knuckles. I love it! And the card that came with it says topaz is the stone of faithfulness, so it totally works. I figure, if we can only afford a chip of a diamond, I'd rather go big with a different stone. It isn't cheap but my husband's wedding band is a tungsten band with celtic knotwork around it. It doesn't "match" my rings at all (mine are white gold with a sapphire as the main stone and tiny diamonds going down the bands) but it totally fits his personality. My high school boyfriend and I got cheap matching bands when we were in Scotland on a school trip. They were our promise rings. Thank goodness neither of us kept that particular promise. But the rings were really sweet and cute (celtic knotwork again. I really like it!) We are still friends and we both still have our rings. If I were to get engaged/married now I would totally go non-traditional. However, when we got engaged over 7 years ago I wanted traditional with a twist. I wanted silver w/ sapphires (I'm not a gold fan). What I got was a solitaire in white gold. Which was so big that when my now husband (who really thought it was small) went to go pick out the wrap he had to get the largest sapphires they offered and four more tiny diamonds so the sapphires wouldn't look lost! He spent more on it then I ever would have, I bought him a titanium one with blue inlay for under $200. I have a traditional engagement ring and wedding ring. My husband wanted to use the ring I got him as a gift (I think I got it for our 1-year-of-dating anniversary). It was a $40 silver band with "With all my heart" engraved on the inside. I kept saying I wanted to get him something else but he said he loves that ring and really wanted it to be his wedding band. I told my husband that if he proposed using a diamond engagement ring I'd say no. I also told him that it would be crazy to spend 6 months salary on a piece of jewelry. My engagement ring is a rather understated but gorgeous aquamarine (my birthstone) in an art deco setting. White gold. I don't do yellow. Our matching wedding bands are also white gold with a design that we both like. We picked them out together at JC Penny's and I don't think we spent over $250 for both. While alternative cheaper rings would be kinda cool every once in a while, I don't think I'd ever take my band off, even though I don't always wear my engagement ring with it. I know our rings are just things, but they are perfect and I don't think anything could compare. Kris, I love the fingerprint thing! Traditional wedding rings here, but I love hearing what the rest of you are doing. My engagement ring, wasn't a ring at all, it was a Burning Man logo stamped onto a penny and then made into a necklace. My fiancee at the time never, ever took it off, until he gave it to me that is. He proposed to me at Burning Man in front of his whole family! Then my wedding ring we bought cheap from a Venezuelan gangster. I have gotten a few upgrades since then, but the one that is the most important to me is that burning man penny. I wore out the original cord that it was on, and have made it into a few different necklaces since then, but none are the same as that first one. For an engangement ring I want a sapphire because it's way less expensive than a diamond and much prettier. I would definitely wear a non-traditional wedding band... in fact my boyfreind and I are considering having something made that has paw prints around it because we're huge dog lovers (and that's part of how we met). If I were to ever get married, I would LOVE this ring. Or anything else on Fred Flare, I love their stuff. My engagement ring was something I chose off of Ebay for like $100, and it was a synthetic heart-shaped gem (maybe mystic topaz? I couldn't find an example anywhere online) that had green and purple in it. Everyone thought it was really cool. I loved it - still do. But I don't wear it anymore, it just gets in the way! I left behind my original wedding set after about 10 years...my work is too hard on jewelry. Originally I used a QVC zirconia...pretty, very blah. But for our 15 year anniversary, we got matching rings, which are sterling silver in a swooping wing design with blue enamel. They are beautiful and unique and were well under $100 a piece. From Sheila Fleet of Orkney, Scotland. Gotta love the internet. Weeeeel, I have a toe ring... on my finger. :) My husband and I didn't have a lot of money at the time and he desperately wanted to propose so he found the prettiest thing he could find in his price range. Which turned out to be a $25 sterling silver band... a toe ring band. Lol. He says he'll buy me a diamond one day but I tell him I have all the riches I ever need. He and my two babies and the gift of not having to work therefore being able to stay home with them. Our Wedding rings are simple bands with Tengwar inscriptions, and the inscription is from the Dark Crystal "The Two made one"; thus combining our two geeky obsessions. They were inexpensive and the perfect wedding rings for the both of us. I would never ever ever go with traditional. My husband and I had traditional rings when we got married, but we soon both gained weight, so we quit wearing them. Then they got stolen. We didn't wear any rings for a long time, then we made some from wire and hematite. Later we made some different ones from wire and garnets. After that...um...I don't remember, I think we had a couple others in there, and a period where we didn't wear any for a while again. We've both been wearing stainless steel rings for almost 2 years. But we're now both losing weight, so before long we'll be looking for something new - and I'm sure it will be non-traditional. We were married with bands we picked up cheap at Jazz Fest. They were silver funky bands that looked nothing like wedding bands. We still love them over 6 years later. My husband and I have puzzle rings as our wedding bands. We bought them at a medieval fair in NE Ohio (google rings by Pepi). I have the 6 strand twist puzzle ring in silver. They are just beautiful- all hand made. I'd rather that than a diamond any day! When my wedding ring set went missing, my husband braided together sodering wire for me to sear, so that I had something on my finger! I eventually grabbed a plain sterling band from Wal-Mart, but I still have that little braided ring in my jewelry box! My engagement ring was a simple silver moonstone cabachon set on Silver. Simple and sweet. Our wedding rings "were/are" a celtic dragon design in silver that we got for about 50$ each. He lost his at work so we're in the market for a new set. Haha! No. But when my husband was first picking his band out, the man at the sales counter said "You have big hands, you need a big ring" and gave him a ring that was (no exaggeration) a full centimeter thick. I called it the one ring to rule them all. The salesman didn't think it was funny. We got cheap matching bands at a Celtic festival. We were going on a mission trip to Honduras and didn't want to take our gold jewelry (which didn't match). We loved them and wore them before we went down. They didn't last though. Between the bug spray, sun tan lotion, and all the sweating, we ended up with black marks around our fingers and the design came off. All of my rings are not the "norm" so I would love a non-traditional wedding ring. And in our love Entwine us. Yep - makes me cry every time. When he was in the hospital, every single person who saw it commented on how special it was. AS is the one who wears it. Mine's a replica of the arm band Venus is wearing in a Rubens painting - it serves as both the engagement and wedding ring. It's pretty cheap - as rings go. :) My husband's is AWESOME! It's got a laser cut out of the image of the sound waves of my voice saying "I love you!" Brooklyn artist Sakurako Shimizu made it for us. It was not cheap. But geeky! My ring is sturdy 10k white gold, with 3 faceted moonstones. I love it and get many compliments on it . Spent under $300 on it by buying stones ourselves and having ring assembled. White gold wedding band engraved on ebay for ony $85. Says "Love is Patient" Bought my husband several tungsten bands for under forty bucks each so he just wears whatever suits him on any given day. I made myself several other faceted moonstone rings and even in sterling silver they are fun to wear with my wedding band. I hate diamonds and think I ended up with something MUCH prettier. I like those...and, while I've never worn a non-traditional band, I would. When my husband and I got married the first time (we eloped to Vegas then got married again in a regular ceremony), we stopped off at a mall, and got sterling rings 2 for $10. WE then exchanged more traditional rings at our other wedding. I wore that $5 ring on my right hand for 8 years until I lost it on a very cold day while carrying my daughter. I was more upset about that cheap ring than I care to admit. Hubby bought a (fancy) replacement for me for our anniversary that year, but I still remember my $5 ring. I'm loving all your stories, guys! Keep 'em coming! I bought a hunk of titanium and machined my wedding ring and two for my wife out of the same bar. Total cost was $30, and I still have what is left of the same bar, so i could make a spare if needed. I am actually considering your request to make those gear rings, but still am figuring out how i'd do it. My husband and I had rings made from a design we created. They were to be lost wax casting...one of a kind. His turned out as he planned and is carved and interesting. Mine was an epic fail and the mold ruined the ring. So, two days before our wedding we went to a rock and mineral shop and I picked up a small silver ring with a pink tourmaline stone. I still wear it. My (now) husband and I wore matching, cheap mood rings as promise rings for a few weeks. And that's when we learned that we BOTH have metal allergies. D'oh! My husband made our rings from stainless steel nuts. They look like they are made out of silver, but are very unique. asked for a different kind of ring and gave a few examples. he proposed with a black pearl on white gold. it was so beautiful by itself, we decided not to get a wedding ring to go with it. but with the job i have, i kept snagging the pearl. in order to show that i am married, i went to a local jewelry dealer and bought the least expensive white gold band that "matched" the black pearl ring. put together, they look like they are a matching set! Long time reader (of BOTH blogs! ), never commented, but I just had to share this story! I would totally go for a nontraditional ring. When we got married, we couldn't afford any of the bands we really liked, so we decided to get some inexpensive plain gold bands. Picked 'em up for Walmart for under $100 a piece. I really liked that I had something that I could wear anywhere, even in the ocean, and not worry about losing it, or having it stolen. For our 10 year anniversary, my husband bought us new wedding bands with a line from the song of Solomon "My beloved is mine, and I am his" on them in Hebrew. Simply gorgeous. Don't know what he paid - and don't want to know. When I got married we had matching 14kt plain bands, 2 years later I got a diamond band to match my traditional engagement ring. My husband lost and then found his ring 4 years later(in our backyard! )Since those first rings I have gotten many other traditional and non-traditional rings that I alternate depending on the mood. I know opinions differ but to me, you don't wear the same clothes every day so why shouldn't you have a wedding ring wardrobe as well! My husband and I have matching tungsten rings. I didn't want to be the traditional bride and have a "sparkly" ring. I figure I have enough sparkle with my engagement ring! 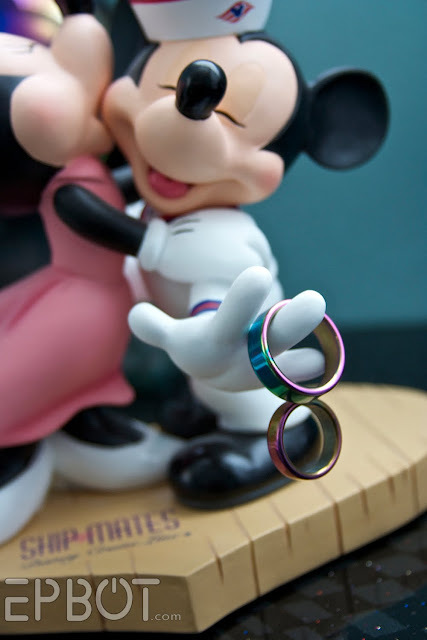 I love the rings you have... and my husband and I love Disney too. Is the Mickey and Minnie statue something you got on a cruise? It really is just a gorgeous ring in person and it's definitely something you don't see every day. We both broke them almost immediately...we were learning to sail a 26' boat...so we "upgraded" to 6-ring Turkish Puzzle ring about the time we upgraded to a 32' boat...which we sailed down the Western coast of North America and across to Hawai'i...but ringless so we wouldn't bust them. But yeah, I'd go the non-trad route again, less anxiety about breaking them. Like some of your other readers, I am allergic to metal. (Funny story, because I wasn't born that way...) My husband bought me a gold/diamond engagement ring, but I can't wear it except for a couple of hours at a time. So I found titanium rings online for us, and I got them with stones - mine is a blue sapphire, and his is a black sapphire. Mine's a thinner band and his is wider, but otherwise they match. Sort of the "his" and "hers" versions of the same ring. I've never liked diamonds when there are so many other pretty colored stones. And I've worn hematite and wooden and jade and shell rings over the years - they don't last very long, but they sure are pretty! The only thing my fiancee could afford was a diamond that was not visible to the naked eye. I tired of flashing it when I told everyone I got engaged, so I got a gigantic and extraordinary ring. It was totally a CZ in gold. It cost like $300 for the wedding set. I still have it, but I've spent a lot of money keeping it up. Someday, I'm going to justify getting an actual ring with a real diamond. I love hematite jewelry, but bear in mind that it is a brittle stone. Once, just by slapping my hand a little too hard on a stair railing, I shattered the ring I was wearing. Fortunately, they're inexpensive, but I wouldn't want to attach too much sentiment to such a fragile piece of jewelry. My hubby proposed on the spur of the moment while we were on vacation in Florida. He went out the next day and bought a cheap heart-shaped shell ring at a tourist shop. I loved it and wore it until we got my "real" wedding set. Now it stays in my jewelry box except when I occasionally slip it on my right hand. Just don't want to break it! My husband and I started dating in high school. We knew how in love we were but everyone else, understandably so, were very skeptical. We bought matching bands, just simple white gold ones, when we were in our teens. We wore them on our left hands for 9 years until our wedding day. During the ceremony we just switched the fingers they were on. I suppose most women love the big fancy diamonds, I prefer my simple band. When he proposed though, he did give me a green sapphire solitaire. I LOVE green and wear it out for special occasions. I don't think I would wear something else on that hand. I've been wearing my ring so long that it feels like it's a part of me. I feel exposed if I don't have it on. All my fun/playful jewelry goes on my right hand. We actually had several conversations about wedding rings - I worried about him. Comprehension wasn't a strong suit. I kept saying that I wanted MATCHING rings. You know, rings that *matched* - not you get the manly one and I'll get the girly version. ACTUAL matching rings! Sheesh - I think it took 3 weeks or more for him to 'get it'. But I do love them. Oh, and him too! the bf knows that i'd like an emerald engagement ring, mostly because it's my birthstone, with a side order of social justice, blood diamonds, etc. When we got married, my husband and I were both older (I was 31 & he was 36 and neither had ever been married), but he had custody of his daughter, who was 4. We just couldn't justify spending a ton of money on a ring... or a honeymoon. We had just moved across the state from two separate towns, so money was a little tight. We couldn't go "cheap, cheap", as I am allergic to everything but gold. We found a beautiful 14K yellow gold band with a princess-cut CZ stone and 6 baguette CZ stones (3 per side in a flair design). It was gorgeous and was only about $400. We got a 14K gold wedding band at Wal-Mart for $20 and had the two welded together. They match perfectly. If the stones were real diamonds, the ring would have easily cost $5,000 (even way back in 1992). My husband's rings was also purchased at Wal-Mart for about $50. They were both 14K gold etched in a tiny, criss-cross pattern that had a nice "feel" to it. He cracked the first one after it was sized. The second one sits in the ring box, as he was always forgetting where he left it when he took it off to wash his hands, etc. I've noticed that a number of you have mentioned about your rings getting in your way while you work. My sister does a rather dirty job, she spends a lot of her time describing soil which is very hands on. So my brother in law bought her a chain for her to put the rings on while she is at work. My ex-finace and I had planned to go to this workshop where you can make each other's rings. You design them, do all the metalwork (presumably with some help from the pros!) and keep them secret until the wedding day. I didn't want a diamond engagement ring, so I got a yellow sapphire instead. Aside from all the environmental and political issues with diamonds, I just find them kinda boring. I'm a color girl. Ah! It's so much fun reading these stories! I'm a huge fan of non-traditional rings. When I moved to Germany I noticed that no one had diamond rings (and even wedding rings aren't such a "must have"). I read an article like this one, which pointed out that the whole idea that we need to have a diamond ring to symbolize marriage came from a very old advertising campaign for diamonds! Grr! I'm very much against the idea that we need to spend a lot of money to symbolize a commitment, and I think funky rings with sentimental value have so much more true meaning. Btw, I've also had some hematite rings break on me, too -- watch out! Before my wife and I got married we had hematite rings, not the iridescent style you pictured by great shiny hues of black grey and white. Be careful with them though. Hematite is startlingly brittle and I had a few break in various accidental and quite stupid ways. Hubb and I have been married nearly 7 years and haven't bought bands yet. Part necessity and partly because we wanted to order something handmade. A search on Etsy brought up plenty of choices and I think were going to end up going with some titanium bands in a charcoal color. They aren't going to cost us that much and since we were so non traditional wedding (I was sick, we got married in a wiccan shop becuase the shop owner is a friend and a JoP, and then went for pizza up the street.) big expensive bands are just not our thing. Nice and all, but just not us. My engagement ring has two small diamonds in it fused together with glass, Hubb said one for him, one for me. My husband wears a band made of meteorite. My ring has a moldovite, which is a green stone that was created by a meteorite impact. I have nerve damage on the left 3rd and 4th fingers, and wearing a ring is painful. Fortunately, my man and I planned on getting tattooed rings from the start! My engagement ring is one of those. . .what's it called? Love knot? Rings. For a real one with a diamond, they're around 5k. My sterling silver, cz one cost my fiance $25. Excellent. Anyhow it fit him perfectly. I loved the fact that it was secretly made from a quarter. We're artists and we're geeks. So together we designed my engagement ring, which I wear as my everyday wedding ring. I threw a fit at the idea of an engagement ring. Useless waste of money, I said. But he wanted to propose with one, so I let him buy one out of those "gumball" machines. It's actually quite pretty and I still have it. For our wedding rings I wanted antiques. Something with a past even if I didn't know what it was. Found a beautiful rose gold band with a sapphire in a belcher setting. Fit perfectly. No resizing. Meant to be! Wanted something the same for my husband, but the shop owner didn't have anything that matched on display. We had settled on a plain gold band until she had a eureka moment, ran to the back room, rummaged through a shipment that had come in the day before, and emerged with a ring that almost exactly matches mine. Rose gold, belcher setting, sapphire. If I had needed a sign that would have been it. What are the chances? Thirteen years later and I wouldn't trade our $300 (for both!) rings for a million. I do! My engagement ring is a cushion cut sapphire in white gold filigree. I guess it would be considered Victorian? in style. Most people don't realize it's a wedding ring. So I guess that counts and non-traditional. Scott and I have both lost a lot of weight, and we've dealt with rings in different ways. He bought two tungsten rings from Amazon, one that he calls his "Tron ring" for home wear, and a plain one for work wear. I still wear my original band, on my thumb. I also have a replacement band that's moved to my middle finger, and I got a $20 3-gem cubic zirconium ring to wear if I'm feeling fancier. I've been engaged for over a year and have yet to get an engagement ring. I inherited my grandmother's set in Oct, but it's too damaged to use, and no one wants to melt down my platinum to make a new one. A couple of weeks ago, I picked out a silver and amethyst ring from a jeweler at the 127 Yard Sale for $14. I gave it to my fiancee to surprise me with later. We found his wedding band on etsy for $65. Not as cheap, but still way less than my sister and BIL paid! My wedding ring never really fit me because my husband got the wrong size, and I never had it re-sized. So, I think I'm on my 3rd "replacement" wedding band. For a while I wore a plain silver band I got at Wal-Mart for $29, then a claddagh, but now I have a new "official" wedding ring. My hubby bought me a wonderful and expensive white gold ring with a row of diamonds in the band for my wedding ring. Now that being said at the time I was a bartender with my hands in water constantly so I never wore my nice expensive ring to work, instead I bought a very similar $15 ring at the local indoor year round flea market. It was horrible though it turned black with tarnish inside of 2 weeks, lol but I still wore it! I have always hated diamonds, so I made my husband buy me a mother's ring type thing. It has a ruby in the middle, and my birthstone (turquoise) on one side and his birthstone (unfortunately, diamond, but it's super small) on the other. Then our actual wedding rings were a $100 set of gold bands from JC Penney. The funny thing is neither one of us wear our wedding rings right now. Mine was lost when it was taken off so I could have surgery, and my husband's flew off in a baseball stadium while he was clapping. Neither had been found or replaced. I still wear my engagement ring sometimes, but the gold band keeps breaking and pinching my finger. So until it gets fixed (again) I'm once again ringless. My husband and I just got married in July and the rings were somewhat amusing. Both of us had been married before with rings we hadn't really cared for so getting exactly what we wanted was paramount. Originally we were going to have rings made and I stopped by a pawn store on a whim one day, looking for inspiration. I walked in and there was my ring, waiting for me. It is white gold with three princess diamonds, 10 baguettes, and six "stars" (tiny diamonds) set into scrollwork on the side. It reminds me of a crown, and I feel like a princess when I wear it. My husband dithered on rings for the next five months, finally deciding on a tungsten carbide ring that we purchased off of ebay. I also purchased my wedding band off of ebay, a quiet charcoal grey 2mm tungsten carbide ring with a lovely silvery sheen that matches his. I started taking off my engagement ring for daily chores after the great bread dough mummification incident and subsequent three day clean and pick fest, then I put it up after my 8 year old daughter threaded onto the puppy's ear (but momma, you told me girls should have fancy engagement rings if that's what they want, and Roxy wanted it!!) but I do make sure to put it on when I leave the house because I love the way it throws sparkles and fire around with abandon when the sun finds it. Mine is traditional, but I love some of these ideas mentioned here, especially the elvish/Lord of the Rings ones. My husband has gone through three bands, and now doesn't wear one because of the job he does. My band is very small as is the diamond on the engagement ring (in fact it's so small you can barely see it). It was all we wanted to spend at the time, but I've worn them for thirty years and hardly ever take them off! I wouldn't trade them for anything different. I hated yellow gold and didn't care for diamonds, but my husband didn't think sapphires looked right for engagement rings. So I got a princess cut diamond on a platinum band. But I adore it now, it's so clean and simple. He originally had a traditional heavy platinum wedding band, but a day before our one year anniversary he went running into the freezing cold ocean and it went flying off, never to be found (this after me telling him repeatedly that it should be re-sized!). So we bought a $15 sterling silver ring from the boardwalk and he wore that for about 2 years. The edges were sharp and uncomfortable, though, so I eventually got him another platinum band. Sometimes I'm sad that we went the traditional route when I see some of the amazing rings out there, but I still love my classic diamond solitaire. My hubby and I have regular, traditional rings -- they are not high end by any means, but they do the trick. My brother-in-law has a duck band for a wedding ring. It's an actual ring, but fashioned to look like the bands they put on ducks to track them (he's an avid hunter). My Nephew is in high school and instead of a class ring, they are getting him one of those too (something he'll wear outside of school). (I linked a link w/ my name--hope it works). I wouldn't go with hematite myself, but that's just because I've broken every single one I ever owned. And on silly things like accidentally hitting a shopping cart with it . . . so yeah. That would probably be a bad thing! At the time, my soon to be wife was working for the Archdioceses of Los Angeles as a teacher. We had to do a rushed Catholic wedding to satisfy her employer, as she could have been terminated otherwise because we were living together. So, we went to the local mall and got a set of sterling silver bands. It also happened that our wedding rings weren't ready in time for the official legal ceremony. So, we've been married in the silver bands twice. I wear a silver celtic band on my right hand. My husband gave it to me back when we were still dating and he was spending a year abroad. It was his promise that he would come back. When we got engaged, I really wanted to use it as my wedding band, but also wanted a pretty engagement ring. Since this ring doesn't really lend itself to being worn with another, I ended up with an engagement ring that I love, a wedding band that I'm ambivalent about, and the really meaningful ring on my other hand. It works for me. My wedding band is pretty traditional, and my engagement ring is a solitaire promise ring (MUCH cheaper than most engagement rings). My husband's wedding ring, though, is a white gold version of the One Ring. He told me he'd only wear a wedding ring if it could be the One Ring, so I got it for him (For about $600...)! Oh yes, My husband and I got matching rings that were supposed to be silver when we lived in Arizona. We bought them form the native americans on top of South Mountain in Phoenix. They turned our fingers green! :) But we liked them anyway. I have a mood ring as my "alternative wedding ring" for times like the week I was a camp counselor and didn't want to leave a diamond band in the cabin while I was swimming in the apparently-bottomless lake. I also bought an expandable-band ring with a whacking huge chunk of resin with gold glitter and a dried flower trapped inside of it for when I was pregnant with my son and my fingers where expanding but I was seated behind a desk all day and guys were hitting on me if they didn't see either a) a ring or b) my massive baby belly. My husband and I met online so it was only natural for me to find our rings there. My husband has a celtic pattern - dog and bird I think. I have a celtic knot pattern with a sapphire solitaire. I love diamonds but our budget didn't at the time. In fact, I paid for my own ring. Oh, hellz yes! 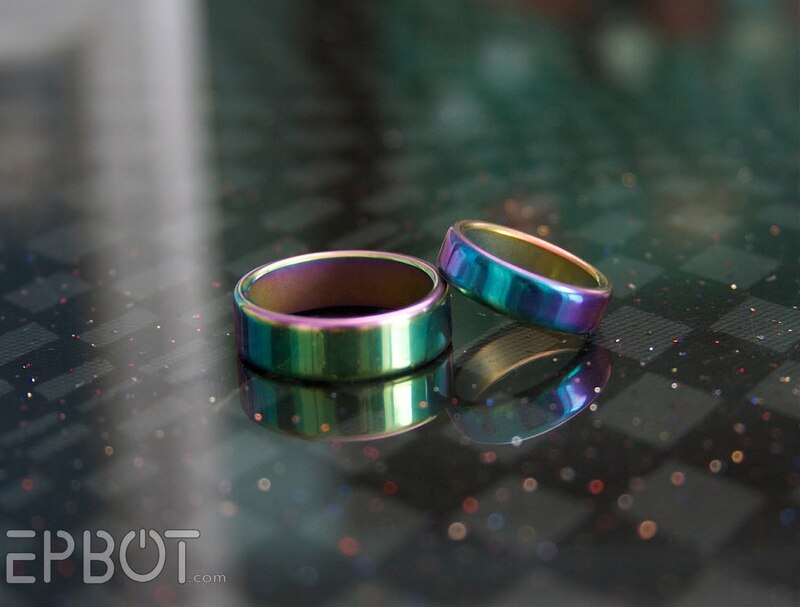 My husband and I got titanium bands like years ago (I always forget how long. Maybe I should have had the date engraved in mine?). Bought online for $90 total -with shipping- and got free engraving. Mine says "My (as in his) Jennai (a nickname for me)" and his says "I"ll be a hot dancer" because I couldn't come up with the perfect non-sappy engraving, and he had an Incubus song in his head. I refuse to wear a ring I couldn't put my hand in my pocket with or that I'd freak out if I lost or broke. I don't think there's any other way. And it totally went with our wedding... justice of the peace's garage in between classes. Our witnesses were found in the parking lot on the way to the guy's house. And one was really called "Troll" Heh! Oh man, those rock. I would totally wear something like that for a wedding ring. My engagement ring is tanzanite (instead of diamond) because it is my favorite gem. I love the idea of non-traditional rings. John is so cute for wearing his out!! I have made my husband promise to turn the carbon in my body into a diamond when I die (really, there's a service for that!). I would prefer he wears me, and he'd better not give me to the hussy that comes after me... but if I wind up pawned for some other happy person, at least I know I'll be "forever"
I'm getting married in eight months and figured we'd get white gold bands to match my engagement ring, just because "that's what you do." I had never even thought about the alternatives. Reading all the comments was great, and I'm going to run some ideas past my fiancé about titanium, tungsten, or even stainless steel. I love things that are just a smidge out of the ordinary. :) Thanks for posting all kinds of awesome ideas and starting these wonderful discussions! Our wedding rings are titanium, because that's what the space shuttle is made out of! My fiancee wears a ring now, but he came up with an adorable alternative for me. Carnivale was amazing. It was like living in another world. I loved it. Then the last day of Carnivale came. (The last day is the most elaborate and important.) We planned to spend the last evening in Piazza San Marco. Just asfter the sun went down and all of the tiny lights turned teh Piazza into a minature city of stars, he dropped to one knee. From inside his vest, he pulled a glittering necklace. THen He asked me to marry him. In Italian. I said yes, of course. As for the engagement "ring", my necklace is a one of a kind antique. It has an enoumous emerald (my favourite stone) set in a ridiculously elaborate white gold with so much tinly detail etched into it. The chain is very fine, made of flat rings that are also engraved with delacate designs, and seet with periodical tiny embellished plates that have bits of ony and diamond in them. It is stunning. For our wedding, (January 13th! Eeep! )he has some new surprize planned. And I know, there will be no rings. He promised. I'm loving reading all these stories! Not married myself, but I adore rings in general, and would love something nontraditional. It's not an engagement ring or anything, but I bought this ring for myself a year ago AND I LOVE IT. I wear it all the time! @Annie - those sound awesome! I love the idea of the bracelets, and the Tolkien nod! @Anonymous @August 25, 2010 11:22 PM: The Song of Solomon is some of the most beautiful poetry I've ever read, what a nice inscription! @Elizabeth Bennet - I loved the connection between your ring and your husband's. How neat that they're different, but connected in meaning! What a great thread, loving reading them all! My husband proposed to me with a ring he made out of copper wire and a piece of gravel. I did say yes. That ring was a little too cumbersome for regular use, so he did buy me another small band. That one is now too small :( so I picked up a cheap sterling silver ring that I wear. It works just perfectly for me. some of the weaves just seemed courtly enough to satisfy my inner geek. and the sheer fact that I HATE DIAMONDS WITH THE FURY OF OVER 9000 SUNS! Hematite is actually SUPPOSED to break. It absorbs negative energy and when it can't absorb any more, it breaks. I have a friend who, when she was going through a really rough patch, went through a hematite ring every week! My wife and I have plain unadorned titanium rings. :-) We like the fact that they are simple and beautiful, but also essentially indestructible, and yes, they were very inexpensive. My engagement ring is a gorgeous star sapphire ring. Not one of those gaudy ones with a huge crust of diamonds around the edge, very simple and elegant. Sadly, my hands are no longer the same size after several kids and some extra pounds. I don't wear it anymore. Also, the design is faulty. A few months after our wedding I was doing some laundry and barely tapped my ring on the edge of the washer. The stone popped RIGHT out. We took the setting to the store where we purchased it, but the design had been discontinued. They had one left in stock, and the compassionate sales person exchanged it for us. Someday when we have gotten to a point where we are not just barely making ends meet, I hope to get my ring re-sized and/or re-set in a sturdier setting. Sadly, it seems many places will not work with my star sapphire because "they don't carry that type of stone, and wouldn't be able to replace it if anything happened to it." Grrrr! For our fifth anniversary, we went on a weekend trip to the quiet little mountain town where we had our honeymoon. At the time, hubby's job required him to leave his wedding ring off for safety reasons. Well, guess what he forgot to grab on the way out for our trip? I wasn't thrilled, but I had to laugh at the humorous element to the situation. He bought a sterling silver puzzle ring to wear in its place, and I got one as well. We wore our matching puzzle-rings the rest of the trip, and I had lots of entertainment on the car ride home figuring out how to solve the puzzles. Then, as a sign of his commitment to take care of me, and for him to put his "claim" on me, my boyfriend ordered a leather collar with a simple steel ring on the front. Hanging from it is a heart shaped tag with my name on the front, and his name and address on the back! *squeee!! * I'm not allowed to wear it out of the house because it would cause way to many questions... but I love having it anyways! When my husband and I started dating, we figured out pretty quickly that we had found "the one". However, we were still in university at the time and both felt we should wait for that period of our lives to come to a close before starting the next one (Marriage). However, we loved each other and enjoyed symbolism, so we went out to the mall and bought the first plain sterling silver rings we found. "Promise rings" I guess they're called. I think they together cost less than $20 and they didn't even fit our fingers. They were both a little too big. We wore them on chains around our necks. My fiancee and I have stone turtles that we got from a Renaissance faire in Ohio. Hers is white with a brown body, and mine is shiny dark blue with a black body. They mean the world to us. And we're probably going to get silver turtle necklaces when we get married. It's just our thing. Neither of us really do rings per se. My dad and his partner aren't married (yet), but they got matching silver bracelets that are these threaded strings of silver and look totally cool. :) I think they should just keep those, personally, but she works in a jewelry store so there'll probably be a ring involved. I, personally, am all for either a nice celtic knot ring, plain silver, or something relevant to the culture of my spouse. Or maybe just a little tattoo on my finger. My hubby and I have traditional rings, but on our 5 year anniversary I got us wooden rings, and we switch them out quite a bit. My husbad wanted to wait until we had money to buy me an engagement/wedding ring set. I hate that it's become all about bling for the girl. So I waited until he was away at Army training to buy him an inexpensive stainless steel band with our favorite endearment inside "I love you forevers" for Christmas. He bought me mine the next Valentine's day (he was still gone at the time) Each band was less than $30. Which is nice because he ended up having his ring stolen by Afghanis while deployed and I had to buy him another. jen just be very careful with your rings. if they are anything like regular hematite rings then they are very fragile. my family has a cabin in new mex and every summer we would go and i would get a bunch of those rings for like a dollar each and they would break in a day or 2. if u slam ur hand too hard on anything, blammo! its done. but very pretty love the rainbowiness. Well, I can't wear rings and my partner "doesn't". (He's been married before, and would never wear his ring) Since he does wear amazing lovely watches, we decided if we marry or have a commitment ceremony, we get fancy special watches instead. My DH and I will celebrate our 42 nd wedding anniversary tomorrow. When we decided to get married, we were still in freshman year of college, and it was the 60s anyway (1967 to be exact!). An engagement ring was not an option! In Old Town Chicago, we each got Turkish Wedding Bands--4-part puzzle rings--as out engagement bands. He took his off a year or so later, when he was working as a baggage handler at the airport, and I had mine cut off during my first pregnancy. We still have them in my jewelry box. Great memories! My husban has a habit of losing rings. After two expensive ones (including one that was a replica of his dad's ring, who died when my husband was 7), we moved on to rings In the $25 range. Now if he loses one we can replace it. We both have Greek Key rings because he is Greek and I like them. My father made his and my mother’s wedding rings out of old silver quarters. The total cost was fifty cents. Almost thirty years later they are still married happily. I liked that family tradition. I had seen a grandmother unintentionally scratch her granddaughter in a grocery store with her diamond ring and that turned me off of diamonds. When my future husband and I started dating, I let him know, that I wanted to make our own rings too. It took him all of five minutes to figure out that he would not need to save up for a grand engagement ring . . . so there was no reason to wait to ask! We only dated for five minutes before becoming engaged. I made his ring, and he made mine. The designs are meaningful both of our commitment to God and to each other. Total price tag: seven dollars. Four years into the marriage, I think it will last. My husband wears a small white plastic band off a bottle as his ring. Everyone loves it cause it is white and wants to know where we got a perfectly white one.... SURPRISE! Its always a great time explaining it but he loves it. I'm sorry. I can't get past Minnie trying to eat Mickey's face off. It's distracting. My husband's ring is oh so traditional, and he won't let me get him a nicer one, but mine are both special. He was in the Air Force Academy when we started dating, so he only got about three weeks at home, and then he had to go to a base somewhere for experience. The year after we started dating, it was in San Francisco, where he found me a really simple, handmade silver ring. It's two strands of silver woven around each other. That's my actual wedding ring, and it's the first ring I've ever had that didn't make me itch. Until I read all these, I didn't know metal allergies were so common! My engagement ring (which fits against the wedding ring like it was made for it) is a claddagh with a sapphire for the heart, and it is white gold. It has fallen off a few times, but it always comes back to me. The problem is, my hands change sizes rather dramatically by temperature, and get cold easily, so a simple resizing won't work. All these comments have given me ideas about alternatives for travelling and other times where I wouldn't want to lose the important ones. For a year and a half i've been wearing a plain sterling silver $14 band as a wedding ring. When I got pregnant, my wedding ring didn't fit (um... yeah, that was 4 years ago) and my husband finally got tired of looking like he was out with his mistress. And yes, I know I could get it sized, but that's like admitting i'll never loose the weight! I LOVE the magnetic rings though. I would totally get one of those! Long time lurker on both sites, so hi! I'm german btw, so diamonds are not traditional here. 10 years ago, my now husband had to work 2 weeks in Russia. To avoid hearing the then normal "Are you married?" question from every female he mt he asked whether i would lend him a ring. We both never wear rings - he works with microchips, I wear latex gloves. So I asked my granny. She lend him her late husbands wedding band. When we got married, we got dog tags - on account of having our 3rd date at a friends MASH marathon weekend. I don't know if it qualifies as geeky as such, but it IS non-traditional. My husband proposed to me after a fireworks show. He asked me what I thought of the music that they played to go along with the show, and I made some snarky comments about this and that. He then started saying something about how the soundtrack is the most important part of any movie and how music is the basis for life and then got down on one knee, and asked if I would be the music that accompanied his life. Sadly, post-baby fingers make it unwearable currently, but it's on a chain round my neck. We have tungsten rings that we had engraved with Norse runes selected for their individual meanings (done in one of the Tolkien fonts just 'cause they looked cooler). Since my hubby is an orthopedic surgery resident and they use tungsten in some of the implants, it's doubly geeky and hard for him to destroy. My engagement ring was gold and garnet, but since I work in the theater often, I always took it off to keep it safe. So one night at the movies, we passed a bubblegum machine with rings. I made my fiancee stop and buy me one -the first try he got a gold ring with a red stone :) 25cents -not bad :) I still have it 9 years later, though it's broken and the gold paint has flaked off. Our wedding rings are fairly traditional, but when I got pregnant, my ring wouldn't fit anymore. So I made him find another ring machine (they're hard to find in our city) and this time it took him $1.25 to find one he thought I'd like. It was a plain metal band painted gold with a small green plastic stone in it. eventually the stone fell out, but I still have the band in my jewelry box. Late to the game but I love all the stories!! We both have traditional rings but since he can't always wear his (he's in the Army and with his job it can sometimes be a safety issue). So right before this last deployment we got ring tattoos. Slightly nerdy in that they say "gra go deo" which is "forever love" in Gaelic. Even my mom who isn't a big fan of all our tattoos likes these. I have a small gift section inside my store, and my best selling items have been $5.00 stainless steel men's rings, and $10.00 sterling silver and CZ "birthstone" rings as well as $10.00 sterling bands. I seriously cannot keep up with demand, and I see them on the hands of soooooo many of the customers in my store. I get a little whoop of glee every time I'm grocery shopping or getting gas or something and I see a clerk with one of my rings on their hand. I'm designing an engagement ring that will have a lab created (CAUSE IT'S CHEAP! DUH!) blue diamond, set in an art-deco/Edwardian setting. I got a steal on a sterling silver wedding/anniversary band in a heart pattern with genuine blue diamond in the hearts, and am thus needing to have a ring that will coordinate. I have two years to get the engagement ring designed and paid for, plenty of time! My fiance and I got a $60 CZ art deco ring as a placeholder, and I know I will continue to wear it on my right hand even when I get my "real" engagement ring. It's just stupendous. I'm not married or engaged but I have a copper spoon ring that was my Great Aunt's. I stole it from my mom and recently began wearing it every day. I just love it and it's so unusual. It really needs a good polish though.. plus my finger is green. I know this is an old post, but I had to tell you what we did. I married a man and a woman, and we had TRISCELE (three spirals) rings from a Chivalry Sports (aka RenStore) catalog! I think they were less than $20 each, but they were so special to all of us. We talked about someday getting them remade in platinum or titanium or some other "fancy" silver metal, but never got around to it. My Aunt and Uncle had their initials tattooed on their ring fingers when they were married. When my parents were dating, they bought cheap gold colored rings in disneyland, and proclaimed themselves "disney married". When they actually got married, they had actual gold rings, but my dad broke his elbow, and his ring was cut off. The next time we went to disneyland, they bought the same kind of cheap rings as they had disney married in fifteen years or so earlier.